GetYerGoat™ Presents great Goat Yoga designs. Goat Yoga is the latest craze! Doing yoga at a farm near you with playful goats dancing around and on you during your yoga session – this is nature’s stress buster for sure. This entry was posted in goat gifts, T-shirts and tagged funny goats, GetYerGoat Shirts for goat lovers, goat apparel, goat shirt, goat yoga on March 7, 2018 by goatlady. Creating great goat shirts for goat lovers since 1995! 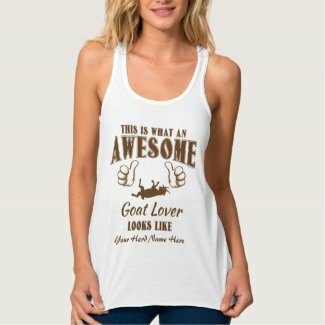 This entry was posted in goat t-shirts, T-shirts and tagged best selling goat t-shirts, birthday gift for goat lady, christmas gift for goat lovers, Customized goat shirts, favorite goat shirts, funny goat lady shirt, funny goat sayings, goat shirt on December 4, 2017 by goatlady. Every once in awhile, you stumble upon a phrase that immediately incites you to learn more. “Goat yoga” is one of those times! So what’s the big deal you ask? GOATS ! The Goats are the big deal – lay people (those who do not raise goats ) are finally getting it! That goats are awesome creatures and a lot of fun to play with and be around. Those of us Who DO raise goats are thinking.. WHY Didn’t I think of that? Well if you are like me – it never occurred to us that all those hours laying in the grass letting the goats jump all over us and playing with them was a potential money maker – If you can teach yoga and you have goats I suggest to jump on the bandwagon NOW! I’m sure there are many places who need Goat Yoga classes offered – there are just a few now..
And the goats are loving it too. “They want to be where the people are,” says Morse (of the Oregon Goat Yoga Class) . They’ll walk around and sit on the mats and chew their cud, which is so methodical. Goats being the curious creatures they are and naturally loving, make a perfect combination for stress relief and getting back in touch with nature. We (heart) Love Goat Yoga as much as we love our goats! It’s hard to be sad and depressed when there are baby goats jumping around- even adult goats – those eyes will melt you every time – Goat Happy Hour is the best way to describe the time spent doing Yoga routines with the goats – Goats are natural Stress Busters – anyone who has spent countless hours with them will tell you – it is impossible to be in a bad mood around goats . So while Goat Yoga may sound like just a trend, I think this is a trend that will stay for quite awhile. Check out the great Goat Yoga designs we already have to offer in our shop – adding more each week. This entry was posted in Goat News, goat t-shirts, T-shirts and tagged baby goats, farm life, funny goat t-shirt, GetYerGoat, goat shirt, goat yoga, Goat yoga is a thing, goat yoga shirts, I heart goat yoga, meditation, popular goat t-shirt, stress busters, trendy goat yoga on March 9, 2017 by goatlady. We have recently added Baby Goer Goats too – bringing our goat breed paintings up to seven – Boer goat, Pygmy goat, LaMancha Goat, Nigerian Dwarf goat, Toggenburg goat, Saanen goat, Alpine goat and Pygora goat. We have created these portraits of baby goats so they look great on any color background – whether you choose a light colored shirt or black these baby goat portraits will look great ! 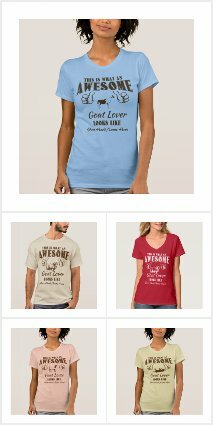 This entry was posted in goat gifts, goat t-shirts and tagged baby goat paintings, baby goats, boer goats, freaking love baby goats, funny goat t-shirt, goat breeds, goat kidding, goat lovers mugs, goat portrait paintings, goat shirt, goat t-shirt, goat tote bags, goats on t-shirts, I Just Freaking LOVE Baby Goats, LaMancha, LOVE Baby Goats, nigerian dwarf, nubian goat, pygmy goats, Typical Signs of Early Labor on March 5, 2017 by goatlady. From time to time friends and family tell me to lighten up, it’s “just a goat” or, that’s a lot of time and money you spend on “just a goat” but they really just don’t understand.While the following aren’t our words – they do reflect our sentiments. Many hours have passed and my only company was “just a goat”. Some of my proudest moments have come about through “just a goat” and some my saddest moments have been brought about by “just a goat”. But in those times of darkness the gentle touch of “just a goat” gave me comfort and reason to overcome the moment. “Just a goat” brings into my life friendship, trust and just a lot of joy. “Just a goat” brings out compassion and patience that make me a better person. Because of “just a goat” I rise early every morning rain, hail or shine, take lots of exercise and look longingly into the future. So, for me and other people with goats, it’s not “just a goat”, but all the hope and dreams, many fond memories and the pure joy of the moment. “Just a goat” brings out what’s good in me and diverts my thoughts away from myself and the worries of the day. If you too think it’s “just a goat”, I hope that someday you can understand that it is the thing that gives me humanity and keeps me from being “just a person”. If you understand that it is not “just a goat’, next time your hear that phrase, just smile because they really just don’t understand. This entry was posted in goat gifts, goat t-shirts, T-shirts and tagged funny goat t-shirt, GetYerGoat, gift for goat lover, goat gifts, goat lovers gifts, goat shirt, goat t-shirt, goatlady, goats, just a goat, There is NO Such thing as "Just a Goat" on February 24, 2017 by goatlady.